Childage 5-12 years old. 4 yrs old and under are free. 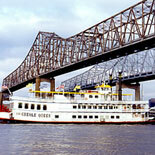 For the best riverboat cruises in New Orleans, climb aboard the Creole Queen. 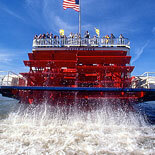 Cruise the Mississippi River in style to the Chalmette Battlefield, site of the 1815 Batrtle of New Orleans. View the French Quarter and the Port of New Orleans from the river as the Captain entertains you with a detailed narration of New Orleans landmarks, history, vessel information, and river lore. Disembark at the site of the 1815 Battle of New Orleans, Jean Lafitte National Historical Park and Preserve, where you can tour the Chalmette Battlefield including the Malus-Beauregard House and the Chalmette Monument before re-boarding for return cruise. 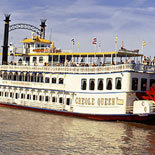 Cruise the Mississippi River aboard New Orleans' most luxurious riverboat, the 1,000 passenger paddlewheel Creole Queen. It's the place to be, to see the sights and sounds of New Orleans. Cash bar and a la cart food available. 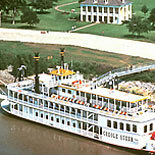 Buy your eTickets today for the Chalmette Battlefield Cruise and learn the history of New Orleans, the fun way! Boarding Daily: 1:30 pm. Departure: 2:00 pm. Return: 4:30 pm. The New Orleans Creole Queen ticket booth is located at the Riverwalk Canal Street Dock, #1 Poydras, New Orleans, LA 70130. Port of New Orleans Pl and Poydras St.
Child Ticket: 5-12 years old. 4 yrs old and under are free. Cruise times may be altered or canceled due to weather and safety concerns. You may exchange your tickets anytime before the cruise time. Vessel is wheelchair accessible. Gratuity is not included in the ticket price. Tips are appreciated. The boat is fully enclosed and climate-controlled for passenger comfort. All interior areas of the boat are non-smoking. Passengers who enjoy smoking may do so on the outdoor observation decks.